Mass on Pentecost Sunday at the Pantheon ends with a shower of red rose petals fluttering down from the oculus, the open “eye” in the center of the massive dome, thrown by the basketful by intrepid firemen hanging from ropes. Seating for Mass is by reservation only and a huge crowd waits outside the massive doors, staggered throughout the plaza waiting for a peek at the rose shower — a sign of the Holy Spirit coming to earth. 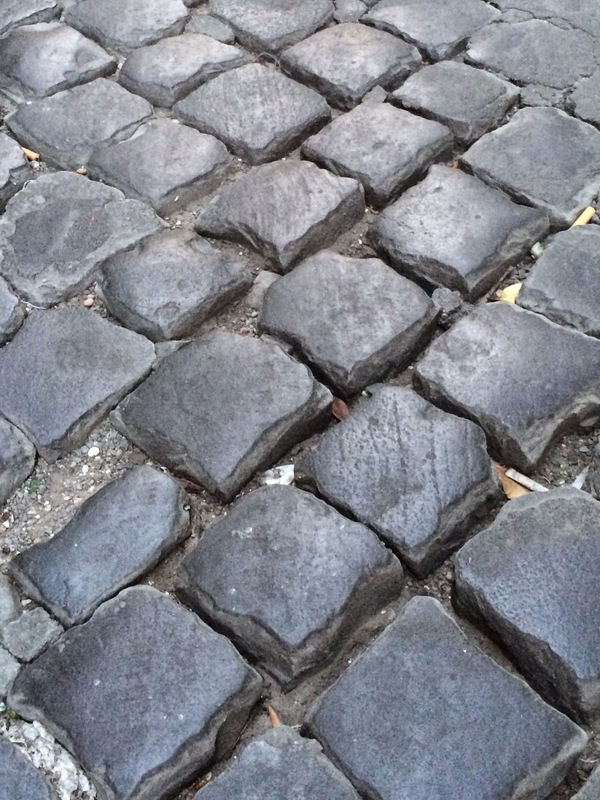 The custom is almost 2,000 years old, or so they say — perhaps even before Rome converted to Chritianity. It’s charming, and I am torn between this and attending Shavuot services at the Rome Synagogue. This won, on the theory that since Pentecost is tied more specifically to Judaism than any other Christian celebration, there must be some ancient connection at work. 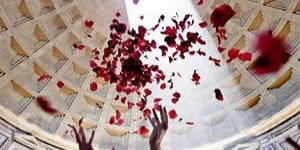 Plus, when else will I see a rose shower from the ceiling of a 2,000 year old temple? 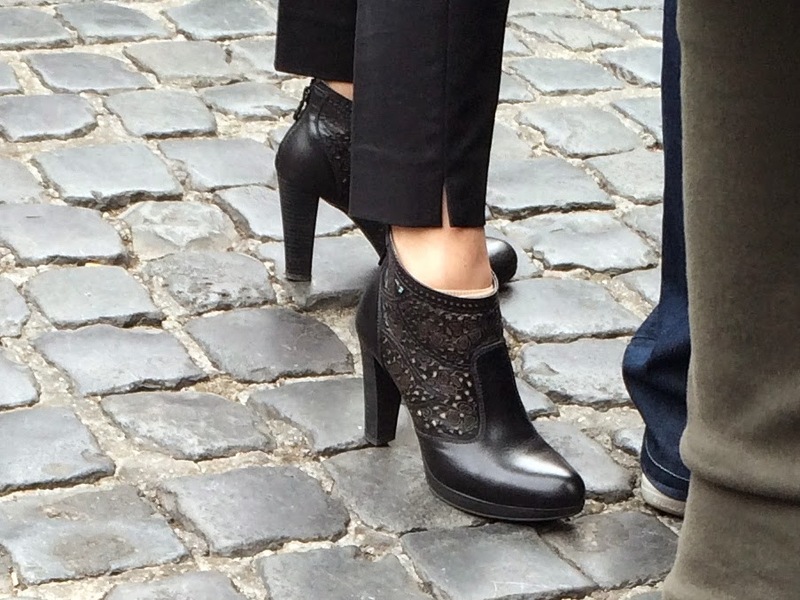 Bad girl… full disclosure – this is not my picture; no way could I get this close. 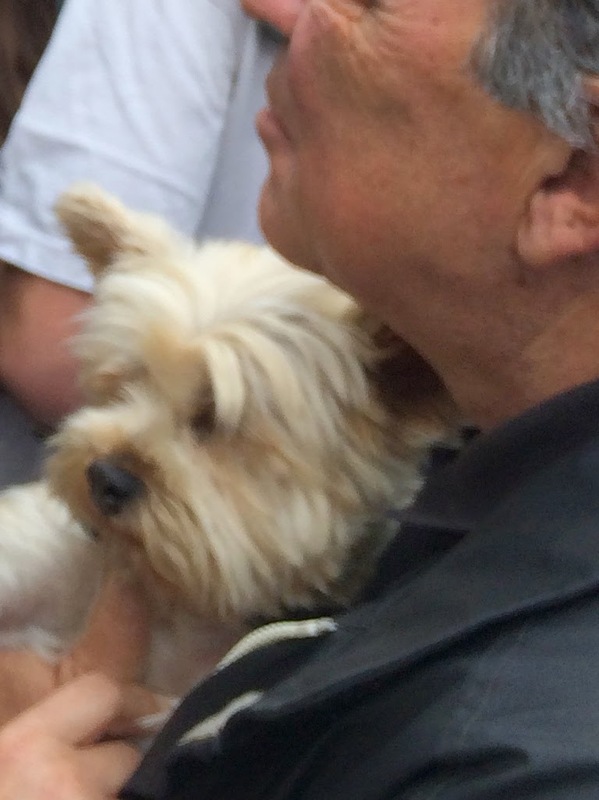 Pup and owner wait patiently outside the Pantheon for the “rose parade”. Pup is much calmer than many of the humans in the crowd. 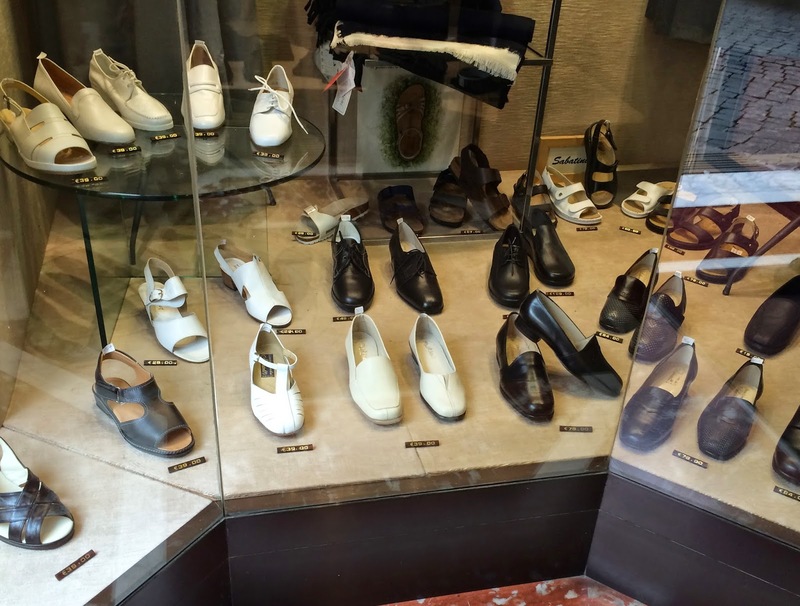 These shoes from an ecclesiastical shop, presumably meant for nuns, are just about my style. They bear a strong resemblance to SAS. I wonder if I should get a catalog? Not crazy about the color selection, however.. 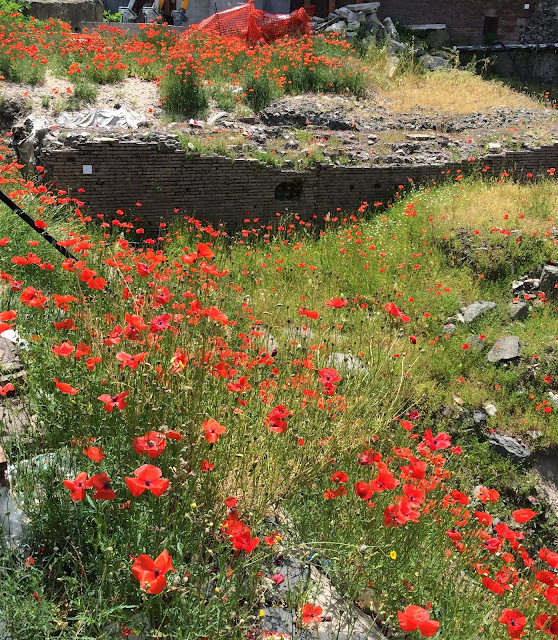 The city is mobbed; we are floored by the crush of people – in tour groups, guides waving flags, busloads of Chinese – small screaming children unimpressed by dark churches and jumbles of ancient stones. These poppies at the forum would be a great way to get everyone to shut up and take a nap. 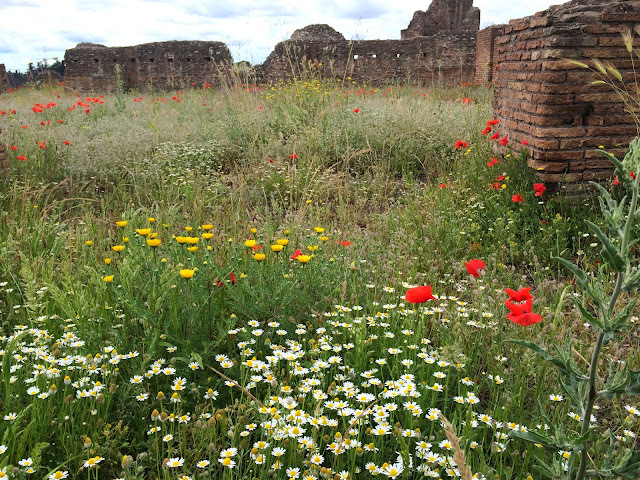 Somehow no tourists have made it to this spot on the top of the Palatine, where Romulus and Remus were rescued by the great she-wolf. On the edge of the Palatine Hill where no one has yet climbed with strollers and melting gelato. 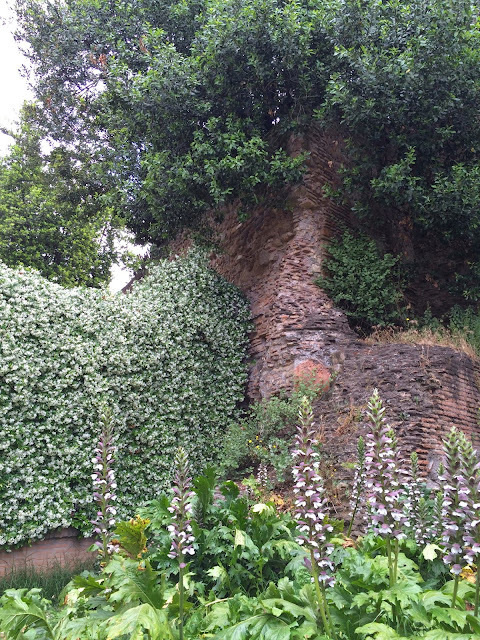 The honeysuckle has run wild with lupines amid the ruins. Really, so beautiful you could weep. The scent of the honeysuckle is everywhere at night. 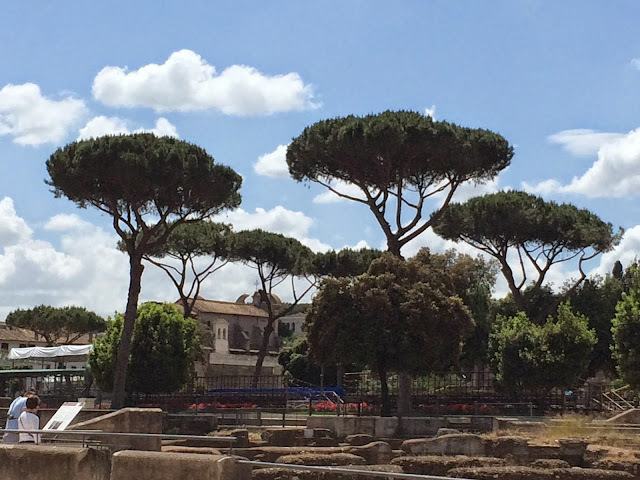 These top hat umbrella pines must have been the inspiration for Dr. Seuss’s fanciful trees. It’s just hard to be grumpy in their presence. 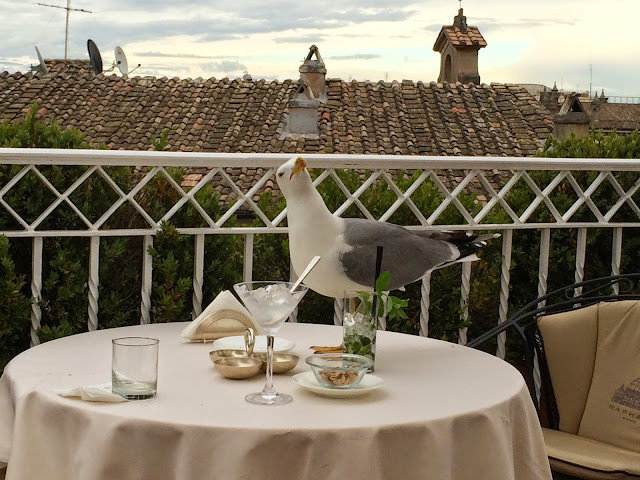 The largest gull with attitude I have ever seen crashes the rooftop bar at the Hotel Raphael. The next day we see a gull dive-bomb a pigeon, rip off its wing, and start to eat it alive. 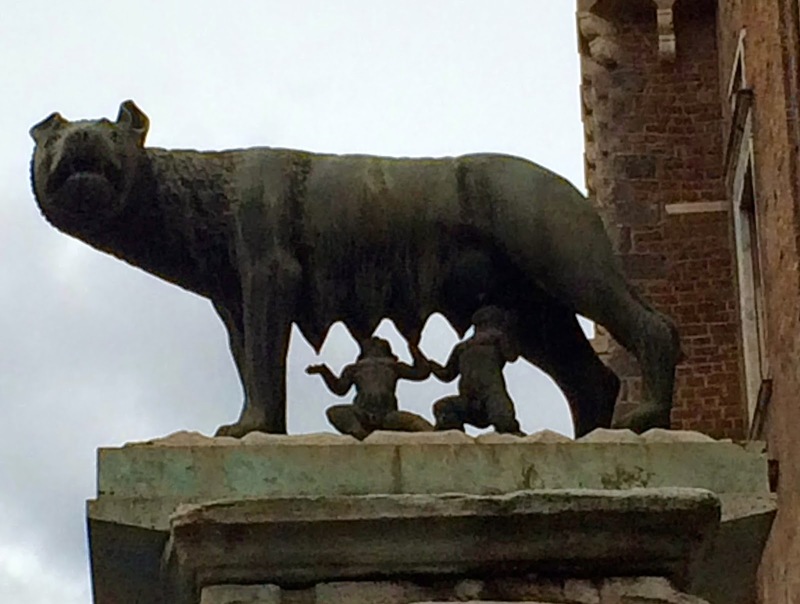 Evidently wild animals still roam the shadows of the Colosseum. The most famous wild animal of them all.